The growth of the smallsat industry has been driven by design and manufacturing advances that have reduced satellite size, production costs and time by orders of magnitude; and by new and cutting-edge launch technologies that are driving down launch costs. Executive Spotlight: Curt Blake, President, Spaceflight Inc.
Curt Blake is the President of Spaceflight Services, and previously served as Senior Vice President and General Counsel. Satellite industry structure and trends, opportunities and the threats of new technologies were discussed by Mahdi Mehrab during a panel discussion at the recent APSAT 2016 event. One of the fastest growing market sectors within the satellite industry is... smallsats. Rural areas across the globe are lacking connectivity, especially in Latin America, Asia and Africa. Finding The Value In The Data Driven World, A single data point is likely connected to billions of other data points. What is the value of geospatial data? The decrease in growth and even contraction in activities related to oil & gas as well as mining are often referred to as the cause of negative effects on satellite services in Latin America (LATAM). Clyde Space is a trusted innovator and supplier of smallsat solutions and has forged a highly regarded reputation over 10 years of fostering the smallsat market and building an extensive mission heritage. The Internet of Things, also known as Machine-to-Machine (M2M), is hardly a new market for the satellite industry. Space is in the midst of its own renaissance—this is seen with the number of launches managed by great companies such as SpaceX and Blue Origin all paving the way forward with emerging capabilities. Parrot’s Bebop 2 is a prime example of how professional 3D printing and Windform materials helped in the construction of this first "leisure drone." On any given day, approximately 2,300 man-made satellites are orbiting the Earth’s surface. KSAT adapted ideas and solutions early on to form the KSAT lite network by understanding the mindset of the company’s NewSpace customers. ESAs Fly Your Satellite! Mission, The painstaking preparations to make sure that something does not go wrong has been a key lesson for the students. For three student teams, the dream of building and working on a real space mission is coming true—at 01:50 CEST (23:50 GMT) on April 26th, a trio of student-built CubeSats were released into space as part of European Space Agency’s (ESA) Education Office ‘Fly Your Satellite!’ program. Automatic Identification System (AIS) is a technology that has been adopted by vessels for collision avoidance. In early May, IRG headed to Norway for a workshop that was hosted by Telenor with a drinks reception courtesy of VeriSat and an evening dinner provided by Kratos. Millennium Space Systems is a vertically integrated provider of affordable, small to medium sized, advanced spacecraft and constellations to support LEO, MEO, GEO, and deep space missions. 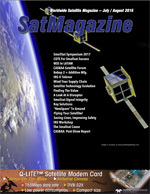 The emergence of new technologies in the satellite industry, including the arrival of HTS GSO and NGSO systems, is prompting the industry to embrace a substantial shift, from offering one-size-fits-all capacity to creating value propositions better tailored to customers’ fast-growing, diverse demand and the price pressures in dynamic economic circumstances.